Last Saturday, Save theHarbor/Save the Bay took more than one hundred kids, parents, Girl Scouts, and adventure-loving residents from all parts of the Boston area to beautiful Spectacle Island (one of Boston's Harbor Islands). Luring rain threatened to dampen our trip, but it held off and instead, we explored the island amidst an ominous layer of fog. The ferry ride aboard the Boston Seaport Boat Charter's Viking Starliner was an exciting trip as we cruised through the fog and occasionally spotted a sailboat racing in the 7th Annual Boston Harbor Islands Regatta. Captain Al's fresh donuts and hot chocolate from the snack bar made the ride that much more enjoyable! I had heard the stories about Spectacle Island's transformation from a dump to a beautiful island of recreation filled with interesting treasures, but I was still pleasantly surprised by the volume of sea glass and pottery scattered throughout the shoreline. From glass bottle necks, to remnants of plates, to porcelain figurines, we seemed to stumble across a whole kitchen's worth of items, and then some. 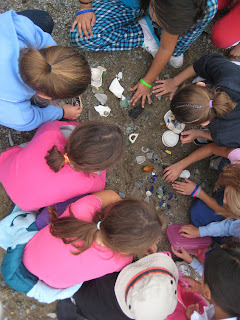 The kids were especially intrigued by the colorful sea glass; giggles and shrieks of excitement could be heard across the beach as they found treasures that had once been another's trash. Aside from scouring the beach (but making sure to leave the treasures for other's to enjoy), families and kids opted to hike on the lush trails to the top of the island, test their hula-hooping skills by the beach, or have a picnic under the gazebo. A few brave souls even went for a swim! The afternoon on the island was a pleasant escape from the city and a great chance for families to experience the spectacular Spectacle Island - which, by the way, got its name from its resemblance to a pair of spectacles before it was filled in to create a much larger island. Fore more information about free, fun things to do on Boston Harbor, join our Boston Harbor page on facebook at http://www.facebook.com/bostonharbor.